Elizabeth Lease, lecturer for the Farmers' Alliance and Populist Party; Gerald B. Winrod, a.k.a. the "Jayhawk Hitler"; and Esther Brown, who challenged segregation in public schools. Here, too, are motivators, like women's rights activist Clarina I.H. Nicholas; William Allen White, the "Sage of Emporia"; and favorite sons Dwight D. Eisenhower and Bob Dole. Then there are the innovators, from trailblazers like Joseph G. McCoy, who changed the face of the cattle industry, and wheat king Theodore C. Henry to Wes Jackson, a pioneer in the sustainable agriculture movement, and the multitalented Gordon Parks, photographer, filmmaker, and author of The Learning Tree. Reformers and preachers, publishers and artists, these fascinating personalities are brought vividly back to life by Dean and his fellow authors. 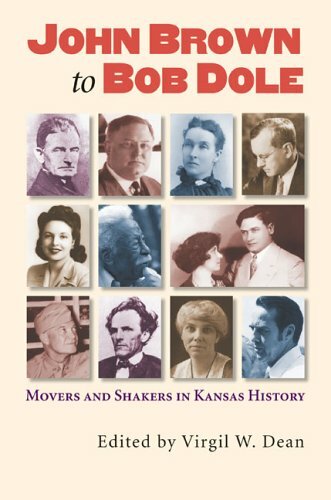 They offer a fresh and engaging look at many of the important themes of Kansas history--especially the state's identification with some of the great radical movements, including abolitionism, populism, and civil rights--and ultimately recapture the true spirit of Kansas and its meaning for the rest of the nation. Clarina Irene Howard Nichols: "A Large-Hearted, Brave, Faithful Woman"
Gerald B. Winrod: From Fundamentalist Preacher to "Jayhawk Hitler"
R. H. Garvey: "Operations Are Interesting"